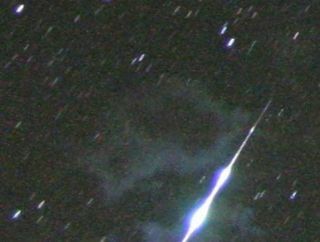 Brian Emfinger photographed this early Perseid meteor shower fireball, with a smoke trail, from Ozark, Arkansas just after midnight on Sunday, July 26, 2009. The First Quarter Moon rises around 3 p.m., and sets around midnight. The Full Moon of August is known as the Grain Moon. In Algonquian it is known as Sturgeon Moon. Other names are Red Moon, Green Corn Moon, Lightning Moon, and Dog Moon. In Hindi it is known as Narali Poornima or Raksha Bandhan. Its Sinhala (Buddhist) name is Nikini Poya. The Full Moon rises around sunset and sets around sunrise, the only night in the month when the Moon is in the sky all night long. The rest of the month, the Moon spends at least some time in the daytime sky. The Last or Third Quarter Moon rises around 11 p.m. and sets around 2 p.m. It is most easily seen just after sunrise in the southern sky. The Moon is not visible on the date of New Moon because it is too close to the Sun, but can be seen low in the east as a narrow crescent a morning or two before, just before sunrise. It is visible low in the west an evening or two after New Moon. Comet Elenin will be well placed in evening twilight for observation with binoculars and small telescopes all month. It will rise from 10th magnitude at the beginning of the month to 6th magnitude by the end of the month, moving from Leo into Virgo. This sky map shows where to look to spot the comet Elenin in August 2011. Mercury will be just to the right of the slender crescent Moon at twilight. Sky map for Mercury and the moon on Aug. 1, 2011. The brightest asteroid Vesta reaches opposition in Capricornus on August 5, but will be well placed all month. It will be between magnitudes 5 and 6 all month, making it just visible to the naked eye. This sky map shows the movements of asteroid Vesta on Aug. 5, 2011. Just before dawn, Mars and open cluster Messier 35 rise together in the northeast. This sky map shows the location of Mars and the open star cluster Messier 35 on Aug. 6, 2011. The best meteor shower of the year will be dimmed by a bright Moon this time around, but is always worth watching. Look for early shower meteors during the week leading up to the peak. Best viewed after midnight. This sky map shows where to look to spot the Perseid meteor shower in August 2011. The Perseids originate near the constellation Perseus,hence their name. Neptune has just completed its first trip around the Sun since its discovery in 1846. It can be spotted in Aquarius with binoculars and small telescopes. This sky map shows the location of the planet Neptune on Aug. 22, 2011. Neptune will be at opposition and can be spotted in small telescopes. Mercury is too close to the Sun to be observed this month. Venus is too close to the Sun to be observed this month. Mars is in the eastern sky just before dawn. It moves into Gemini on the 3rd, where it remains the rest of the month. Jupiter rises well after midnight, and then dominates the eastern sky until dawn. It spends the whole month in the constellation Aries. Saturn is low the evening sky in the constellation Virgo. Uranus is in Pisces all month, visible before dawn. Neptune is in opposition in Aquarius on August 22, visible in binoculars or a small telescope all night long. This article was provided to SPACE.com by Starry Night Education, the leader in space science curriculum solutions. Follow Starry Night on Twitter @StarryNightEdu.